Physicians use methadone as a pain reliever. Some physicians use methadone to treat heroin addiction by substituting methadone for heroin. Unfortunately, they do not realize that methadone is even more addictive than traditional opiates like heroin. Breaking methadone addiction is even more difficult than quitting heroin and the symptoms of methadone withdrawal are more severe. In a recent year, doctors prescribed enough prescription painkillers to medicate every American adult every 4 hours for a month. As a result, pain medication related visits to hospital emergency rooms has spiked over 98 percent in recent years. A recent video from Science Daily points out taxpayers often foot the bill. Trading one opiate drug for another is never an acceptable treatment. Because methadone is totally synthetic (man-made), it stays in your body longer than “natural” opiate drugs. Methadone dependence can easily develop with repeated doses; and its symptoms, like respiratory depression, sedation, and nausea, can begin immediately. 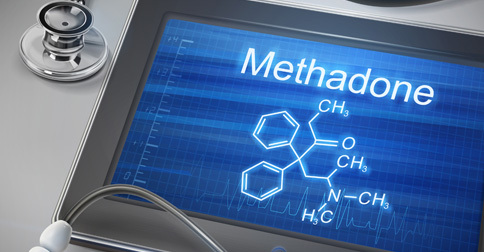 The U.S. Food and Drug Administration warns that methadone can even cause slow or shallow breathing and dangerous changes in heart beat that you may not even feel. Methadone withdrawal symptoms – sensations the body goes through as you attempt to quit – typically hit you harder than the same dose of morphine or heroin. They include body aches and muscle cramping, back aches, leg kicking, irritability, anxiety, chills, shivering or trembling, abdominal cramping, weakness, increased blood pressure, convulsions, insomnia, diarrhea, running nose, watery eyes, sneezing, sweating, pale and clammy skin, nausea with or without vomiting, and thoughts of suicide. These symptoms can last for several months or longer. Due to these severe and lengthy withdrawal symptoms, most methadone addicts find that they cannot “detox” alone. Fortunately, the Rapid Drug Detox (RDD) Center invented the RDD Method™ for “rapid drug detoxification”. A simple infusion of FDA approved, intravenous medications quickly “cleans” the opiate receptors in your body (that is where “opioids” try to attach, to hook you). Before you start Rapid Drug Detox, the RDD Center medical staff screens your medical history and current health. They also perform a psychological evaluation. Once they confirm that you are a healthy candidate for rapid opiate detox, you are able to schedule the procedure. During the procedure, an experienced, board certified anesthesiologist gives you a medication to relax, and then administers a light, general anesthesia. While you rest comfortably, a team of doctors “scrubs” the opiate receptors in your body, using an infusion of intravenous medications. After about 60 minutes of this treatment, you are clean and the worst of the withdrawal is over. Immediately after you are cleansed, you start Naltrexone Therapy, so that the opiate drugs do not re-attach to your “clean” receptors. That is why Rapid Drug Detoxification therapy works so well. Most patients say it is opiate detox without the discomfort. Because the Rapid Drug Detox (RDD) Center invented the RDD Method™ is quick and affordable, patients come from all over the world to acquire RDD. Call them to talk about their cost effective drug detox programs. Yes, you can use your major credit or debit card for payment. Will it work for you? The answer starts with a phone call. When you call, you speak with a professional nurse or an experienced intake coordinator. The call is toll-free. Click here now to contact the Rapid Drug Detox Center or call Rapid Drug Detox at 1-888-825-1020 and take the first step toward a lifetime of freedom from addiction. The RDD Center makes sure that nurses are on call 24 hours a day, 7 days a week, and that the Center’s knowledgeable, licensed medical professionals are always available to answer all of your questions.